After browsing our entire home library, I recently discovered that we don't really own any "horse" books. No picture books with a horse as a main character, no cowboy books, no horse chapter books besides Farmer Boy...zilch, nada, nothing. This is obviously my own fault. Unlike some of my childhood friends, as a child I never developed an interest in horses or in horse themed books. I've actually only ridden twice in my life, both times at a very gentle, leisurely rate. While I find horses very beautiful, I've never had the chance to personally connect with them and experience life around them. Would familiarity have sparked a greater interest? Perhaps, but for now, I'm happy to watch from a distance and admire this incredible animal. Against all odds, housewife and mother Penny Chenery (Diane Lane)—with the help of veteran trainer Lucien Laurin (John Malkovich)—navigates the male-dominated horseracing business, ultimately taking Secretariat on a spectacular journey to become the first Triple Crown winner in 25 years and perhaps the greatest racehorse of all time. After learning about this film I immediately wondered if there were any good children's books available about this racing legend. Two books caught my attention: a picture book, I Rode the Red Horse by Barbara Libby and a soon-to-be released book for young readers ages 12 and older titled, The Big Red Horse, The Secretariat Story by Lawrence Scanlan. I'm hoping to get my hands on the first title so that I can share it with my children, but it is out of print and very few libraries own it. There's also a coloring book, Great Racehorses (Dover Pictoral Archive) that includes several famous thoroughbreds including Secretariat. Life on a Horse Farm by Judy Wolfman and Racehorses by Michael Sandler also sound like something my kids might like, but neither look like they specifically mention Secretariat. Two books meant for adults might appeal to older children because they include photographs: Secretariat's Meadow and Secretariat by Raymond G. Woolfe, Jr. I'm actually a little disappointed in the children's book options featuring Secretariat. Perhaps after the movie appears in theaters, publishers will release more books about this interesting horse. In my searches I did find a wonderful pdf lesson planning kit for educators about horse racing. Author Patsi B. Trollinger wrote it to correspond with her book about a famous jockey, but it contains a lot of general horse racing information and activities. For instance, did you know that thoroughbreds must be registered in a color category? -- Secretariat was a Chestnut. Walt Disney Studios Motion Pictures has kindly offered to give away some cool SECRETARIAT promotional items to a Brimful Curiosities reader. 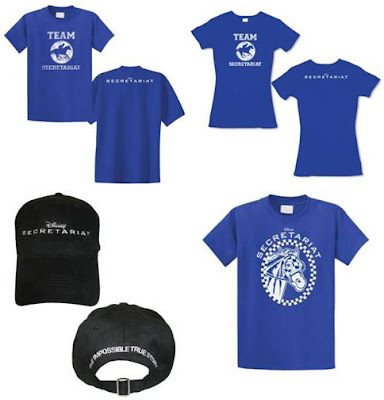 The prize pack includes a Men’s T-Shirt, Women’s T-Shirt, Youth T-Shirt and Hat. To enter, leave any comment relevant to this post or mention one of your favorite horse-themed reads. • Contest ends on Friday, October 8th, 2010 at 11:59 PM CST. One of the first books that I read was Black Beauty. Oh, I Love Black Beauty and The Horse Whiperer. Great books. I am subscribed to Horse Illustrated Magazine, which is great. I loved to trailer to Secretariat. I can't wait for the movie! We read I Rode the Red Horse a while ago. I think I enjoyed it more than my kids did, but I thought it was a good book. Oh, I hate to steal others' answers, but I have to go with Black Beauty on this one! 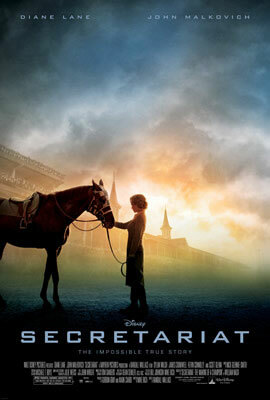 Can't wait to see "Secretariat" in theatres, and thanks for the chance! My daughter and I are looking forward to seeing this movie -- she loves horses as much as I did (and still do). I read a lot of horse books as a kid -- one of my favorites was The Black Stallion and the other horse books by Farley. I did not know that Secretariat was owned by a woman! They never mention that fact and I watch the triple crown every year, when they mention Secretariat. Thanks for the informative post. Black Beauty is the classic in our family! Google follower and RSS subscriber! We like My Friend Flicka. My daughter is in the horse-love stage right now! I read Black Beauty as a child and also loved The Black Stallion. My 2yr old daughter loves horses right now, so we have been taking her to the local fairs so that she can be close to them. Black Beauty is still one of my favorite books! my girls want to see this movie they LOVE horses!!! Our tween and I just read The Horse Secret this summer! I read Black Beauty as a teenager and fell in love with horses! I've always love Black Beauty. I also loved the James Herriot All Creatures series, although this didn't only deal with horses. I enjoyed the book Seabiscuit. I am looking forward to the movie. I remember watching Secretariat on television winning the Triple Crown. I follow on Twitter @mgoss123 and tweeted. I like My Friend Flicka and the Animal Ark series books that are about horses. what kid hasn't read black beauty? it was a classic! I loved Black Beauty when I was young, thanks! I liked Misty from Chincoteague. I really think this is going to be a classic movie for this year. From the previews, there is going to be a lot of love and emotion in this movie. Thanks for the giveaway. I am looking forward to seeing this movie and I also like Flicka as a horse movie. seretariat was a brave horse with character. National Velvet. black was my favorite when I was younger,can't wait to take my kids to see this! Misty of Chincoteague by Marguerite Henry was my first horse read. The story of Secretariat is an exciting one & I'm looking forward to seeing this movie. The movie looks very well done! I always like all of the Marguerite Henry books. I'm so looking forward to seeing this movie! My favorite was The Black Stallion. When I was a kid, I read all of the Walter Farley horse stories. I didn't have much contact with horses in "real life" growing up, I still haven't, but I was obsessed with them and read everything I could get my hands on. I can't name just one. I read the Flicka books, Misty of Chincoteague and the other Marguerite Henry novels, Walter Farley's The Black Stallion series. I had a couple of books about a horse named Gypsy, and a couple of other series about young women at racing stables. My mom signed me up for a horse book club once; I think all I got was the introductory books and then the one at full price (most of my books were used, so these were real treasures): Big Jump for Robin, A Filly for Joan, C.W. Anderson's Favorite Horse Stories, King of the Wind, and Ride a Wild Pony. I loved them all! I always loved Black Beauty. It sounds like an interesting movie.